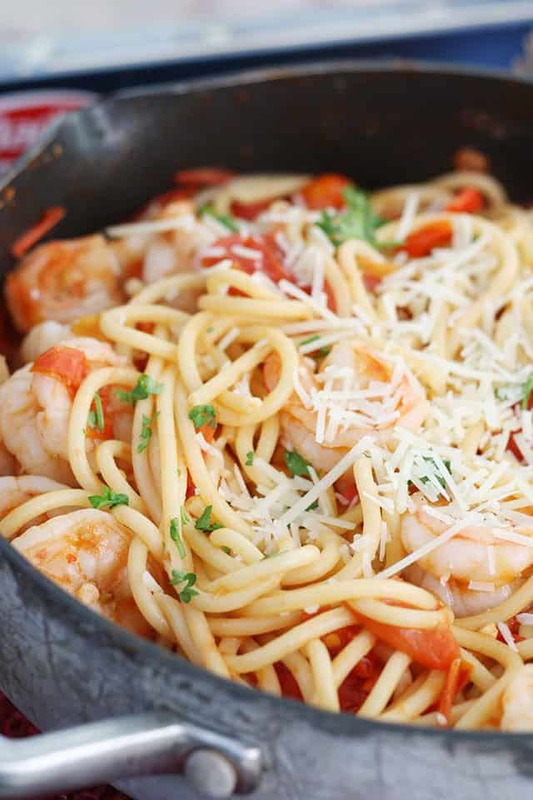 Spicy Shrimp Pasta is packed with flavor and just the right amount of heat. Shrimp, chili peppers, garlic, Bucatini pasta, and topped with fresh Parmesan cheese! I had a lot of success this year with my first backyard vegetable garden and one of my favorites from this year were our little chili pepper plants. 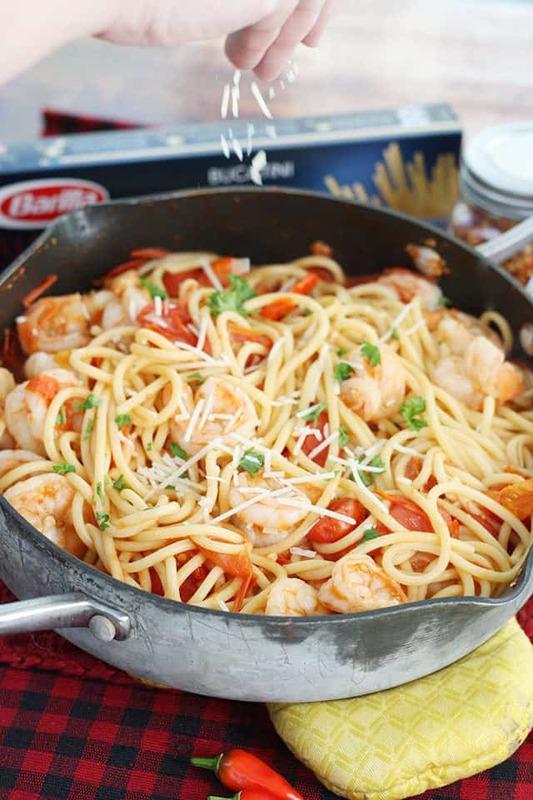 I’m always looking for new dishes to incorporate those little peppers and this Spicy Shrimp Pasta is perfect! Feel free to dial up to heat or dial back the heat according to your family’s preferences. A more milder pepper choice would be peperoncini or serrano peppers. Bring more heat to this skillet dinner with habaneros. Each pepper variety will bring it’s own flavor profile as well, which is perfect with this pasta dish. Where can I find small chili peppers? If you don’t have any home grown peppers on hand, most local grocery stores will carry a large variety of peppers in the produce section. Organic, garden fresh peppers are going to give the best flavor of course, but peppers from the store will work just as well. Bucatini pasta is a thick, spaghetti in the shape of long tubes. 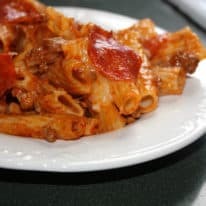 It’s absolutely perfect for dishes like this because it holds the flavor of the sauce and the ingredients all around the pasta’s shape giving more flavor in each bite! Where can I find bucatini pasta? 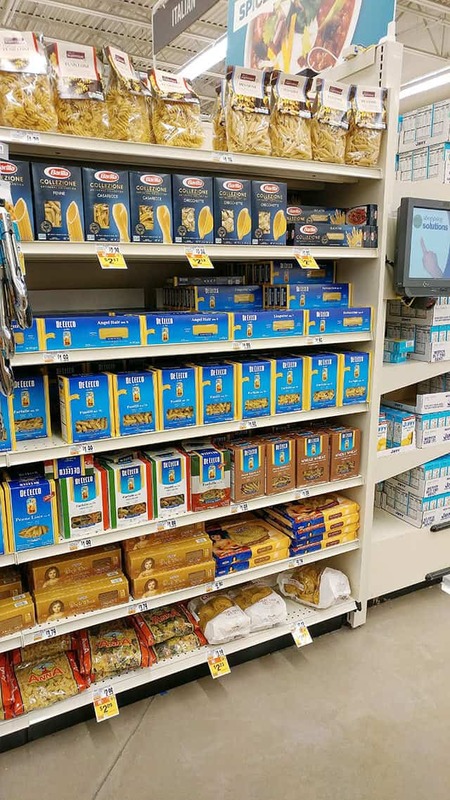 I highly recommend Barilla® Collezione Bucatini available in most grocery stores! I picked up a few boxes while grocery shopping through my local Giant supermarket. 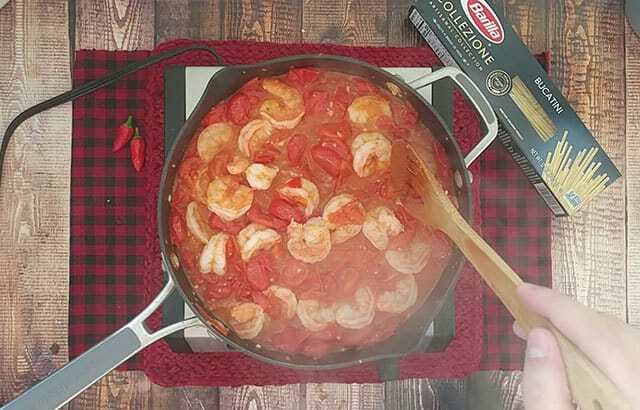 I really prefer Barilla® Collezione pasta because it’s made with non-GMO ingredients and is crafted using traditional Italian bronze plates for that perfect “al dente” texture! Spend $15 on any Collezione products between 09/06/18 and 11/26/18 and receive a $5 reward. 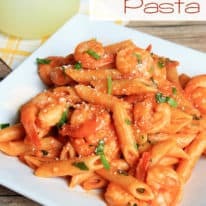 How do I make spicy shrimp pasta? 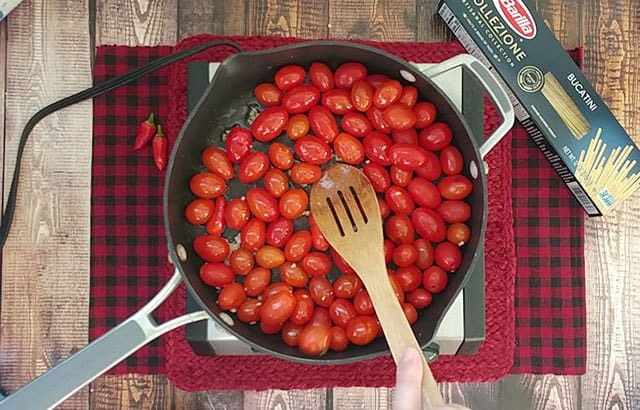 While bucatini is cooking, heat olive oil and garlic in a skillet. Add chili peppers and cherry tomatoes. Saute while pressing the tomatoes with the back of a wooden spoon until they burst to release their liquid. Once all tomatoes have burst, continue to saute until sauce is thickened, about 5 minutes. 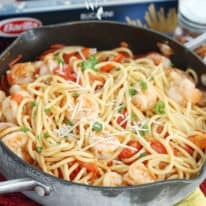 Whisk in 1/2 cup of pasta cooking water and shrimp. Saute until shrimp is pink and cooked through. Drain bucatini once it’s cooked to al dente and stir it into the skillet. Sprinkle fresh parsley, Parmesan cheese, and additional dried pepper flakes on top before serving. 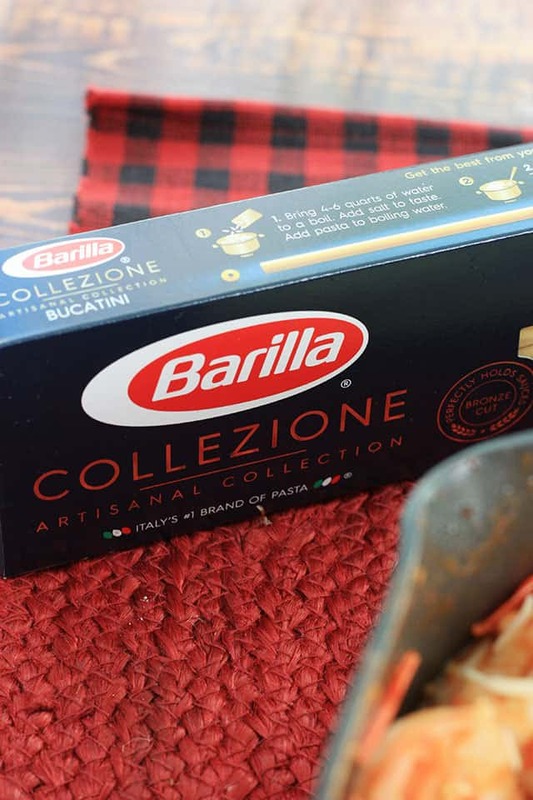 Which Barilla® Collezione variety are you excited to try next? Leave your recipe idea below! 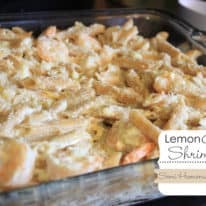 If you liked this recipe for Spicy Shrimp Pasta, leave a comment and a rating below this post! Cook bucatini pasta in a large stockpot according to package directions until al dente, reserving 1/2 cup of the cooking water. Meanwhile, heat olive oil and garlic over medium high heat in a large skillet. Add whole chili peppers and cherry tomatoes. Saute over medium high heat while pressing the backs of the tomatoes and peppers until they burst, releasing their liquid into the pan. Once all the tomatoes have burst, continue cooking until slightly thickened, about 5 minutes. Whisk in reserved cooking water and shrimp. Stir until shrimp is pink and cooked through. Remove from heat and stir in cooked and drained bucatini, turning it over in the pan to coat the pasta with the sauce evenly. Top with parsley, Parmesan, and dried pepper flakes before serving. 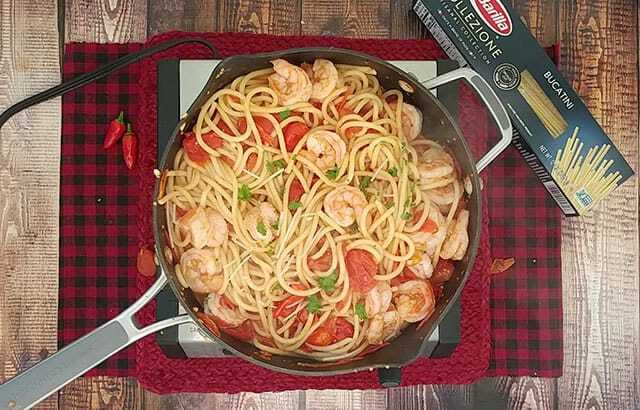 I may be biased because I love everything spicy, love everything seafood, and really, really love the bucatini, but I can say this whole dish combines into a delicious, slow-heat that tastes awesome. Another great recipe. Thanks Kelly! !